CubeSats have a wet mass ranging from 1.3 (1U) to 6 kg (3U) and employ commercial off-the-shelf electronics . A key advantage of CubeSats is that they are small, lightweight and have the ability to form a constellation of cube satellites that communicate directly with one another . To this end, CubeSats require a cross-link communication antenna . This, however, poses some challenges. One of which is designing a low profile antenna that occupies a small area, provides high gain and achieves wide directivity. Another is establishing reliable cross-link communications between cube satellites in a swarm without a priori knowledge of their position. Therefore, it is critical CubeSats employ an antenna system that provides wide directivity and high gain. The most suitable antennas that address most of the aforementioned challenges are planar antennas. They have a low-cost, low profile, light weight and easily integrated with electronic devices. Having said that, a key consideration is the configuration required to enable cross link communications between CubeSats operating in a swarm. To date there has been limited work that uses multiple planar antennas for CubeSats. To the best of our knowledge, only the authors of  have proposed a similar set up to us. However, their design suffers from back radiation that may cause interference with electronic components inside the CubeSat. Another limitation is their robustness during launch because the antennas require soldering connections. Lastly, their antenna is designed for a 3U CubeSat while ours is targeted at 1U CubeSat. In this paper, we propose a unique configuration of six small ACM antennas. Each individual ACM patch antenna is placed at the top corner of each face of a 1U CubeSat. The placed antennas thus provide communication in all six directions. Moreover, they only occupy 11.5% of the total surface area on each CubeSat’s face. Hence, the remaining real estate, i.e., 88.5%, is sufficient to mount solar cells. Each single ACM patch antenna has a small volume, i.e., 50×23×3.05 mm3, and is easy to fabricate. Its main advantage is the use of an aperture coupling technique that does not require a soldering connection. This is important as it makes the antenna robust during the launch stage and in space. Each individual ACM patch antenna achieves a total gain of 5.72 dB, directivity of 6.24 dB and a return loss of -26 dB at a resonance frequency of 2.45 GHz. F. Em. Tubbal, R. Raad, K.-W. Chin, and B. Butters, “S-band Shorted Patch Antenna for Inter Pico Satellite Communications,” IEEE 8th International Conference on Telecommunication System, Services and Application, Kuta, Bali, Indonesia, October, 2014. 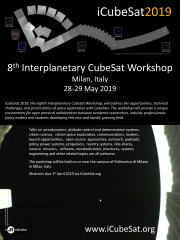 C. Pinciroli, C. Pinciroli, M. Birattari, M. Birattari, E. Tuci, E. Tuci, et al., “Self-Organizing and Scalable Shape Formation for a Swarm of Pico Satellites,” in NASA/ESA Conference on Adaptive Hardware and Systems, 2008, pp. 57-61. H. Heidt, J.P. Suari, A.S. Moore, S. Nakasuka, and a. R. J. Twiggs, “CubeSat: A new Generation of Picosatellite for Education and Industry Low-Cost Space Experimentation,,” 14th Annual/USU Conference on Small Satellites, Logan, Utah, 2000. A. Budianu, T. J. W. Castro, A. Meijerink and M. J. Bentum, “Inter-satellite links for cubesats,” IEEE Aerospace Conference, pp.1-10, March 2013.